Spring has officially sprung, it's no more apparent than here in San Diego, with our morning clouds, warm afternoon sunshine and crisp chill in the air hours after sunset. The kids are home from school, the big Easter Weekend is upon us all, Peter Cotton Tail is busy coloring eggs and readying himself for a full night of delivering baskets full of teeth-trashing treasure's to beleaguered parents, who themselves are scrambling about the vinous landscape looking for the best wine or wines to pair with their Easter dinner. So put down those Easter baskets, throw aside the search for the perfect Sunday morning bonnet and c'mon spit out those jelly beans. Why, because the great folks at Domaine Carneros want to help you with the one thing on your to-do-list today, so put a check mark next to, "find the perfect bottle of vino" for Easter Sunday. Why, because the Brut Rosé Cuvée de la Pompadour, a blend of 62% Pinot Noir and 38% Chardonnay, will have you and your guest hopping up and down for joy as you sip, slurp and splash glass after glass of this wonderful bubbly, you'll think you've found the "golden-ticket" in the hidden Easter egg, and may find yourself running down the street in your Sunday "best" shouting or maybe even shrieking, "I've found-it", "I've found-it". Before we jump, hop or spring into how wonderful this bottle of bubbly tastes, I think you should take a peek behind the purple-stained curtain just a wee-bit. I want to talk about the winemaker; you know the one who orchestrates all the magic that transpires to what's in the bottle. Her name is Eileen Crane, and has often been referred to as America's Doyenne of Sparkling Wine; she has been and remains the face of Domaine Carneros. She is one of a handful of women who are now recognized as leading the way in California’s wine industry, she was also recently recognized as one of the 75 "Most Influential Women in Business" by the San Francisco Business Times. She was also selected personally by Claude Taittinger for the position of company President and also the winemaker of Domaine Carneros, a winery located in the heart of the California wine-scene, at the crossroads between Napa and Sonoma, a winery dedicated to producing world-class sparkling and still wines. 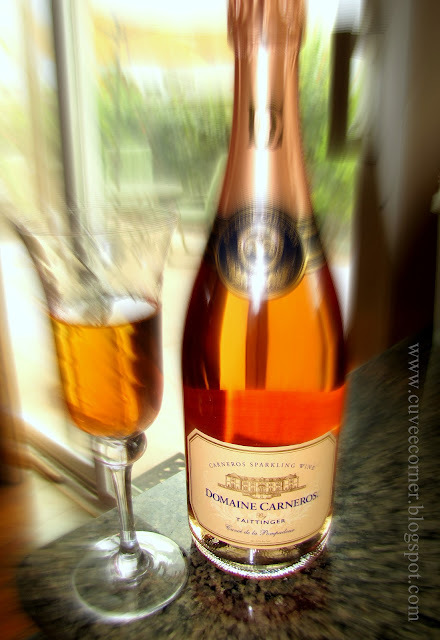 The bubbly from Domaine Carneros, although it cannot be called Champagne; it’s made in the French tradition [méthode champenoise] from famed Carneros region grapes. Now about the real treat for this Sunday's Easter meal and sorry kids but this time tricks [and neither are treats] are not for kids, the Brut Rosé Cuvée de la Pompadour has aromas, that will bounce and pounce on you like a bright spring day. A bouquet of bright floral notes, a freshly sliced Anjou pear, rose petals, spices and dried strawberries. After the first splash-down from the flute, rich lush apple and pear fruit, a tart cherry, a dusting of those dried strawberries, a bite of ripe summer peaches, all touched by wet smooth river-stone minerality, finishing in a mouth coating creaminess. Everything you want in a mouth-watering bubbly and more. This wine delivers over and over and best of all falls into the reasonable price category, with a $34 SRP. I gave this bottle of bubbly a solid score of 90 points and highly recommend it for the upcoming holiday or anytime, so hop on over to your favorite wine shop and grab a few bottles. Here's to a great Easter weekend, be safe, have fun and above all continue to sip long and prosper cheers! My absolute all time fav bubbly from Napa Valley! Great post! I could not agree more with the 90points on the Rose - Cheers! Really?? ahh-cool, so I know what I'm talking about occasionally, thanks =D. Definitely a bubbly-fave here, the Mrs. and I were suduced by its quiet, yet resilient resolve and the brillant effervescent character. Pour, slurp, repeat!